If it all works out, a 74-year-old professor at the University of Washington will hit the jackpot with something that, in a few years, you may be ordering from Amazon. 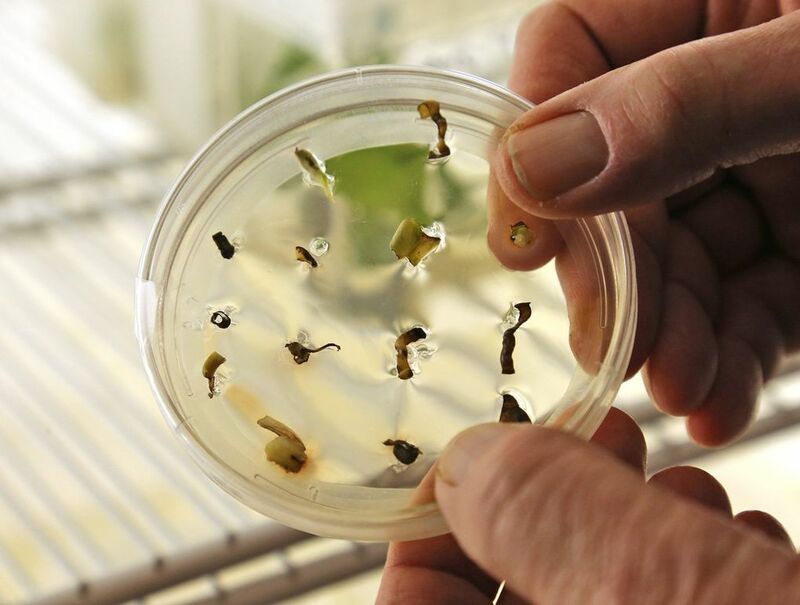 The ticket to ride for Stuart Strand, a semiretired researcher at the UW’s department of civil and environmental engineering, is a genetically modified houseplant that cleans hazardous air compounds we routinely have floating in our homes. “I think it’s going to be big,” he says, although some other researchers in the field are more cautious. Whatever plants there are, are in the lab on the fourth floor of a concrete building behind the historical Northlake Tavern. In these polluted times, we love our air purifiers. In 2017, it was a $2.6 billion market, according to TechSci Research, an industry consultant. Strand envisions air purifiers could be replaced by a simple home greenhouse the size of a double-hung window, with plants at the bottom, some lights, an air vent at one side and a fan on the other side to push through that polluted air. 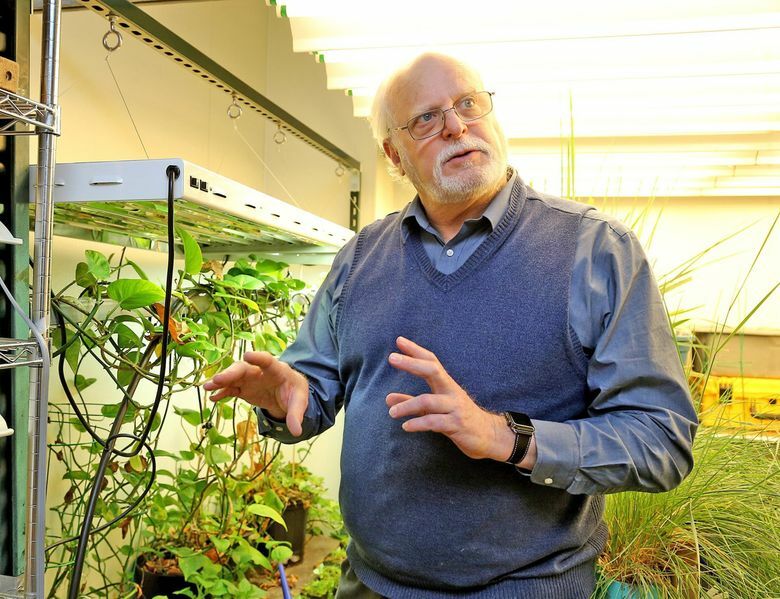 “You can put it by a window, in the middle of the room,” Strand says about a box he made himself that sits in his lab, healthy green plants inside. What he accomplished is news because although houseplants for years have been touted as cleaning air, that’s not really the case. “It’s an alluring and enticing idea. 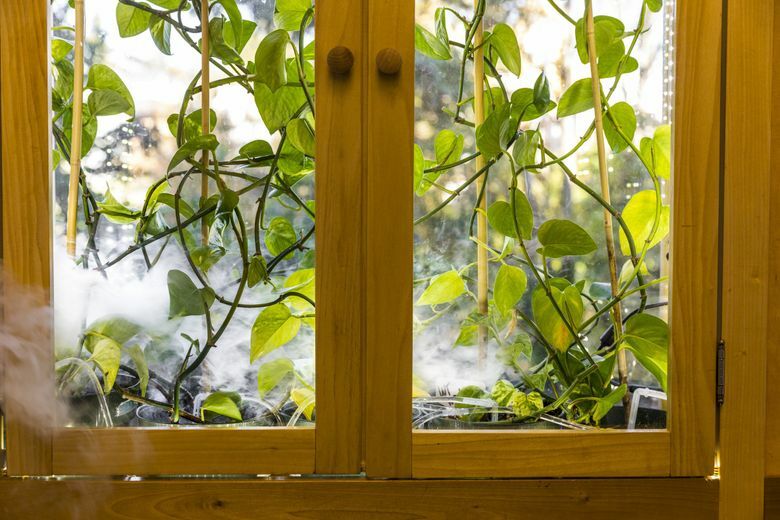 But the scientific literature shows that indoor houseplants — as would be typically implemented in a person’s home — do very little to clean the air,” says Elliott Gall, a Portland State University professor with a specialty in air quality. This number of plants would then create high humidity levels and possible mold, he says. Strand says that 26 pounds’ worth of plants “could do just as good a job as a smoke filter and clean a 126-square-foot room.” He doesn’t believe that’d create a mold problem. 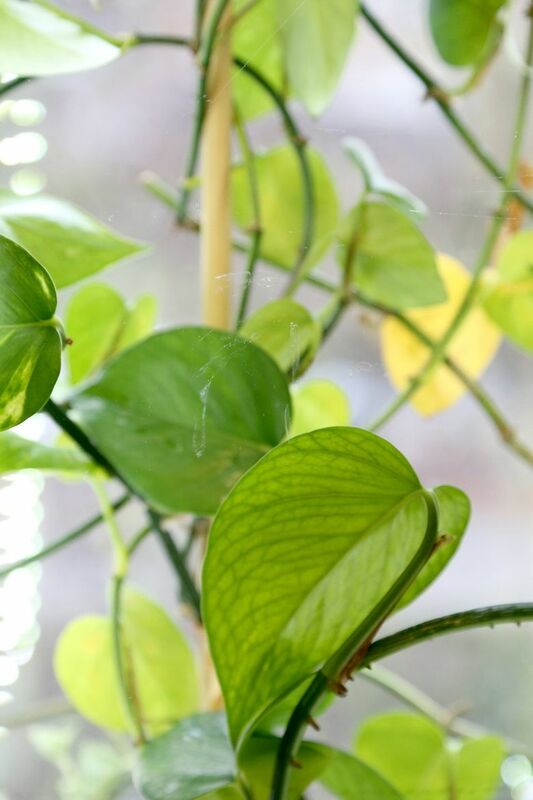 The plant that Strand and co-researcher Long Zhang chose as an air cleaner is a common houseplant known by many as devil’s ivy, although Strand prefers to use a more benign name for it, golden pothos ivy. Originally from the Solomon Islands in the South Pacific, the feds have designated it an invasive species in Florida, Hawaii and Puerto Rico. It’s also toxic to cats and dogs. What interested the researchers is that indoors, the plant is known for its hardiness. It can sit on a shelf in your office, neglected, not even near sunlight, and it’ll still stay green. But how to make a houseplant clean pollutants? All mammals have in their livers a protein that, in humans, breaks down alcohol when we booze it up. That protein has the cumbersome name cytochrome P450 2e1. Scientists, however, just call it 2e1. Turns out that protein can also break down certain toxins in the air. In Strand’s work, the plant essentially becomes the vessel through which the protein works. Here’s how: The protein, whether it’s in our livers or in the plant, takes an oxygen atom from the air and sticks it on the pollutant molecule, detoxifying it completely. These days, a protein such as 2e1 is sold by gene-synthesis companies for a couple of hundred dollars and shipped as a dry powder. No, you can’t buy 2e1 for your basement project; only bona fide institutions, please. Strand could have purchased 2e1 derived from humans. So he went with the rabbit 2e1 gene. The kinds of pollutants floating about homes can be nasty, and sometimes linked to cancer. There are chloroform molecules, a byproduct of our chlorinated water, which become airborne when you take a shower. And then there are the benzene molecules from gas cans or lawn mowers in your garage, just drifting about your home. These compounds can’t be trapped with one of those air-purifier machines, even if they have a HEPA filter. They can trap particles, not the tiny, tiny molecules, says Strand. “A particle can have a billion molecules,” says Strand. The way you introduce 2e1 into the ivy is not by injecting the gene into an ivy plant. You do it by starting with a small stem from the ivy and immersing it into a broth containing bacteria and the 2e1. From that stem grows a clump of ivy plant tissue, now infected by the microbes. As months go by, the clump sits in a petri dish and is coaxed to develop into a genetically modified ivy with leaves. When placed inside a tube that had high levels of chloroform, the concentration of chloroform dropped by 82 percent, according to the research paper. With benzene, the concentration dropped by 75 percent. The research was funded by the National Science Foundation, peer reviewed and published in the prestigious Environmental Science & Technology journal. Strand has a letter from Canada’s Plant Biosafety Office giving approval for sale of the modified ivy plants. It’s too cold in that country for the ivy to survive outdoors. He says the U.S. Department of Agriculture wants further testing to make sure the modified plant hasn’t been changed so much that it’s resistant to herbicides used to control it in Florida. By the time testing and approval is done, it’ll be two years from now, says Strand. The licensing of the GMO ivy project is now with the UW’s CoMotion department, which handles intellectual-property rights developed by school employees. The UW has done very well from the work of its researchers. In the 20 years through 2018, it says, UW staffers have developed innovations resulting in more than 3,489 licenses from the patents that have brought in nearly $600 million in revenue. Not bad for the institution, especially with how the royalties are divided. CoMotion gets 20 percent for “administrative fees,” with the remainder divided equally among the UW, the school in which the research was conducted and the inventors. Meanwhile, Strand is working to modify the plants even further by adding protein that breaks down formaldehyde, found in some floor laminates and cabinets, and tobacco smoke. He has high hopes, although by the time such a device reaches the marketplace, he’ll be closing in on 80. “Hopefully, I’ll still be around to see the first royalty check,” says Strand.